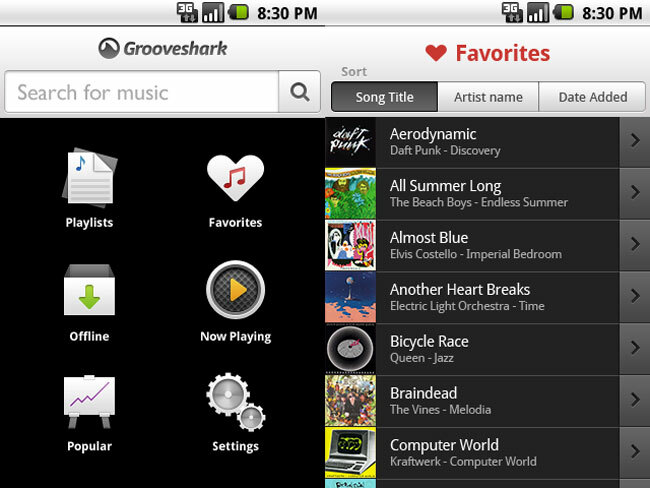 Some of our readers will remember that the Grooveshark App was removed from the Apple App Store last year, just a week after it was made available, and now it seems that Google has decided to remove Grooveshark from the Android market. Grooveshark is a music service that lets users share music with each other, and it has more than 6 million songs online and has been accused by EMI in a lawsuit of copyright violations. Google told CNET, that the application had been removed from the Android Market because it apparently violates Google Android Market policies, although Google did not specify exactly what the violation was. Considering that Google are working with record companies to put together their own music service, called Google Music, it is no surprise that the application has been removed from the Android Market, especially when it is subject to a lawsuit between EMO and Grooveshark, Google obviously want to keep the record companies happy.